This is a great DIY tutorial that could easily go hand in hand with other t-shirt tutorials since it uses only a small part of the t-shirt after you've cut it up for other things! We like multi-tasking with our materials. Thanks to Dollar Store Crafts for coming up with and sharing this tutorial! If you like cutting up t-shirts to transform them into necklaces, pillows, tote bags and other fun stuff, you often end up with a few extra pieces. Here's an easy project that uses up scrap pieces of a t-shirt to make a simple summer bracelet. 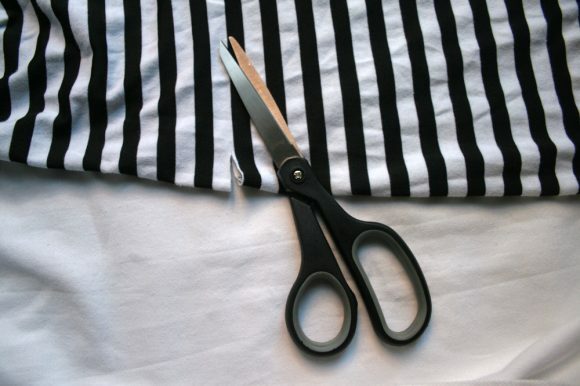 After cutting the useful parts off a t-shirt, save the pieces around the sleeve or collar. In my case, I was able to cut one long strip about an inch or two wide and about 12 inches long. Wrap the ends of the strip with blue tape or masking tape. Feed the strip through a hardware tube. Wrapping and twisting the fabric a bit, feed both ends through a second time. Depending on the length of your scrap, tie any loose ends into a knot or bow or tuck them into the rest of the bracelet (a little like a turban). Fabric glue or stitch into place.